Kanjira is one of the main percussion instruments of the Carnatic classical music system. It is a relatively recent addition with its status elevated to solo instrument by the genius of the late Sri Hari Shankar and more recently the masterful Selva Ganesh Vinayakram. The shell of the kanjira is approximately 2 inches deep and the diameter of the shell is approximately 7 or 8 inches wide. 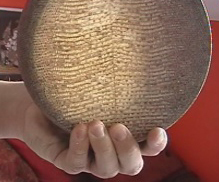 It is a single-headed lizard skin drum. 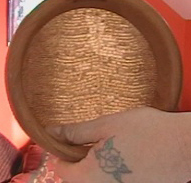 The skin is stretched taut over the shell and is glued on the outside of the shell. In this state the drum is very highly tuned but in performance it needs to be very bass orientated. This effect is achieved by lightly spreading water on the head before and during the show. It’s very difficult to maintain the desired pitch for a prolonged period of time so a kanjira player will need to have any number of kanjiras on stage with him. The drums are at varying degrees of 'wetness' and are switched when of optimum tuning for the bass tone. One alternative to this is the new tuneable kanjira, part of Remo’s world percussion range. 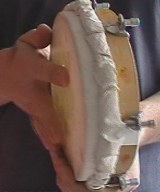 One other very important characteristic of the drum is the solitary pair of tiny brass jingles fixed into a hole in the shell which adds a very sharp cut to the sound. 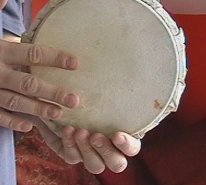 The kanjira is probably the most difficult Indian drum to be effective on because it is played with only one hand, the role of the other hand being to support the drum and bend the pitch with the fingertips. If we look at the holding positions, we can see how this is achieved. If we look at the drum as if it were a clock face, we can see that the left hand is supporting the drum at 6 o’clock with the fingers in front of the drum in a vice like grip. The thumb comes around inside the shell. (I have recently changed my own grip which previously had the thumb along the outside edge at the back of the shell.) We can see how the fingertips come around underneath the shell and touch the head just at the edge. It’s by squeezing here that we achieve the pitch bend. This is aided by a very steep bearing edge inside the drum. 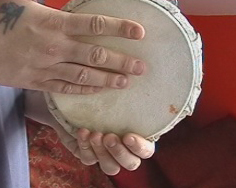 The way the striking hand is used is common to almost all Indian hand drums. It involves splitting the fingers into two striking units. The one fingered striking unit with the first finger and a unit involving the second, third and fourth fingers joined together. Although these are the striking units, they both strike individually with the hand in a normal position, NOT with the hand split into a 'V' as in the picture to the right. front view Our first stroke will be 'Ta' This is a closed non-resonant sound played with either the one fingered striking unit flat in the centre of the drum or the three fingered striking unit flat in the centre of the drum. The Ta sound is a sharpstaccato sound similar to a crisp but delicate slap on a conga. Our second stroke will be 'Tum' This is the open bass sound and is played with striking unit one. The left hand fingers should not be dampening the sound, but the drum must continue to be held firmly. 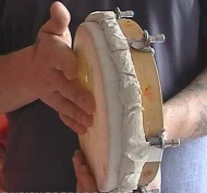 The striking finger should hit the head flat and move away from the head immediately allowing the drum to ring. Bear in mind that the finger should always travel in a straight line to attack the drum and not at an angle. The hand should move in towards the centre for the 'Ta' sounds and out towards the edge slightly for the open 'Tum' sound. I'll briefly talk about the ambiguity of some of the phonetics. The main drum inCarnatic music is the mridangam, a double-headed barrel drum. It is from this drum that a lot of the phonetics are assumed. There are dozens of sounds, each of which mean something different on the mridangam. Drums such as the kanjira have been introduced more recently in traditional South Indianmusic but have employed the same phonetic language, although the possible stroke combinations and different sounds are not available on the drum. This means that a range of complex phonetics are represented by a simpler set of strokes on the drum. This leads to a lot of ambiguity regarding syllable representation on the instrument. It is up the kanjira player's knowledge of how the phrases would sound on the mridangam and other classical drums such asThavil, and his intuition in interpreting them for the kanjira. The notation system I am employing is very simple and on two lines only. The bottom line is always the open 'tum' sound whilst the notes in the middle of the stave are either the three fingered or one fingered 'ta' sound. The syllables are also included on some examples. Our first pattern requires a simple accent pattern using only the closed 'ta' sound with both the three and one fingered units. Our next patterns require the introduction of the open 'Tum' sound with the first finger. Our next pattern requires the introductions of sixteenths using only the closed'ta' sound fingered 1/3/1/3. This is the characteristic fast rolling you hear fromKanjira players. The speed they can get this up to is amazing! Here are some basic fingerings of the five beat unit, 'ta ti ki da tum' The phrase is manipulated int 6, 7, 8 and 9 beat units by the addition of gaps.